I made my first paper dress about 10 years ago, and since then I have made almost 40 dresses in total. My dresses have been featured at benefit events, in 4 runway shows, and even an advertisement in China. Unfortunately, I have not been able to add to my paper dress collection for the past few years while I have been growing this website. Now that my extra fine crepe paper line is launching, I have had the opportunity to get back into this incredible art form, and with a material that I have never used for paper dresses before. It seems like crepe would be an obvious paper material for making dresses, but in the past I have always used either recycled magazines or printed copy paper. I have now made two crepe paper dresses this year (so far ;-)). I know that this may sound silly, but I try to listen to the paper as I am crafting each dress. This extra fine crepe is a such a luscious material for making dresses because it creates a gorgeously soft look. The first dress that I made this year is the white gown that was featured at the Paperworld event in Germany in January. This dress is made with the Chiffon color in my crepe line. With this dress I wanted to create a lovely natural movement with a structure that was reminiscent of a vintage dress circa 1940s. Because this dress ended up with a beautiful bridal feel, I decided to also make a matching bridal bouquet using the same soft hues of crepe. My newest dress, which I made for the 2016 National Stationery Show, showcases a deep purple color scheme using the colors Aubergine and Sangria from my crepe line. My inspiration for this dress was certainly floral, and I wanted this gown to resemble a big beautiful bloom. I explored current couture trends to come up with this corset-on-the-outside design. 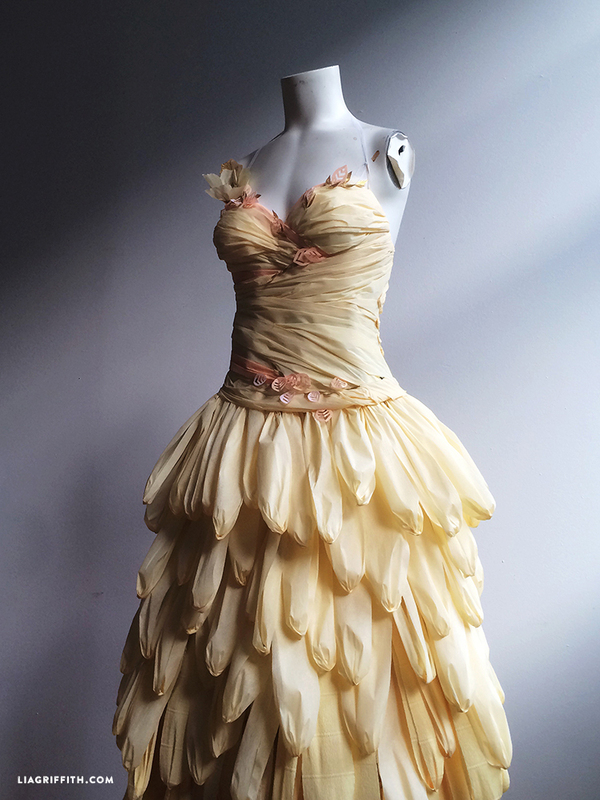 I love how the defined lines of the bodice can offer an edgy balance to the soft petals of the skirt. Just as with my first crepe paper dress, this dress moves beautifully. Making these crepe paper dresses has shown me how much easier this material is to shape than other paper materials. It is almost like a fabric because it is so malleable and delicate. Overall, these dresses have a different voice than my previous dresses. Extra fine crepe paper adds a certain level of femininity that I have always aimed to achieve in my dressmaking, and I am smitten with the versatility of the material. This is incredable.I want to learn paper dress since long time. are you planning to make a tutorials on this one? just curious though, what did you use for the base of the dress?? class on how to create these incredible works of art. Are these dresses washable or how do you get rid of them if they get torn or wet? When I was a little girl, back in the 1950’s, my mother made for me a Spanish dancer’s dress out of crepe paper. The top was one color, which she painted a rose on. 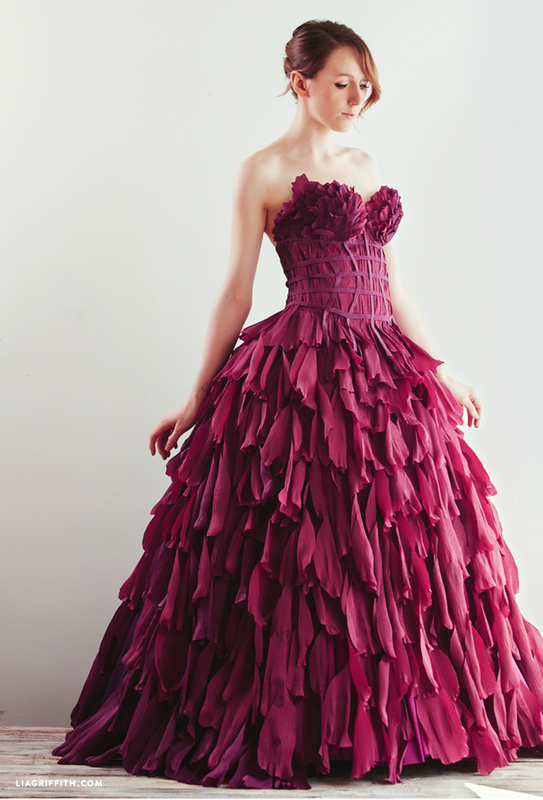 The skirt was ruffles of crepe paper starting from pale pink graduating in color to burgundy. It was fabulous. I was so thrilled to see your dresses and they are gorgeous. How wonderful, that sounds beautiful! This is amazing! Your talent is such a gift and I can’t tell you what joy I get be receiving your emails. This was truly beautiful. Your model is simply gorgeous and the dresses are so amazing. Thank you for sharing! How in the world did I miss this post?!? These are fabulous!!! Fabulous, in every way, from designer to model! Thanks Lisa! Loved meeting you at the show. Wow, these are absolutely incredible. Seriously so inspiring! I wish I had the time to take on a project like this 🙂 I am a wedding photographer, and a crepe paper dress would make for such an incredible styled shoot! They are really fun to shoot. My next dress will be. . white! SO BEAUTIFUL AND INSPIRING. YOU ARE SUCH A TALENT. R U OFFERING CLASSES IN PAPER DRESS MAKING?????? SIGN ME UP NOW!!! A class would be great! We will be making one for next May for my daughter for a local princess contest. The most beautiful paper crafted piece I have ever seen! Amazing — Thank you so much for sharing it. Thank you so much, Linda! That means a lot coming from a fellow crafter 🙂 Glad you’re having fun!